In the category of what I will call the "mini-projector" (bigger than pico and smaller than portable), there were previously only two contenders in our database that put out at least 200 lumens and had a street price of less than $500. ASUS has just increased that number to three with the introduction of their 1280x800 resolution P1 LED projector. At only 1.7 pounds including its power brick, the mobile presenter will find the P1 to be light, quiet, and bright enough for intimate meetings where a large image is not required. 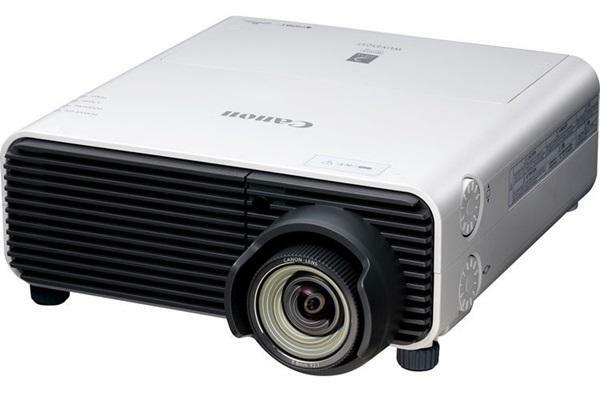 At 200 lumens in its brightest mode, the P1 puts up very good data and video images, but it is the only projector in its class without a built-in speaker. So, if you want to watch movies, you will have to get audio from your computer, your video player, or an external audio system. You will also have to be satisfied with composite video because the P1 lacks both an HDMI and a component video connection. When we first set up the P1, we were surprised to see that its proprietary input connector was located on the upper right side of the projector. The P1's unique input cable contains both VGA and composite video wires so it is rather stiff. Input connectors are usually on the rear panel, and this side mounting caused the input cable to tend to twist the projector if jostled. When sitting quietly, there is no problem, but if you happen to bump the cable, the image will probably shift. You also might consider disabling the automatic keystone correction. When engaged, it automatically squares the image, but it also reduces the image size and robs it of some light. If you do disable automatic keystone correction you might have to spend a little time orienting the P1 to eliminate keystoning, but you will be assured of getting all the illumination available. Like most small projectors, there is no zoom capability in the P1 lens, but its focus control is outstanding. It is smooth yet firm, and overshoot while adjusting focus is not a problem. The lens also provides excellent edge-to-edge focus . . . a characteristic missing in many small projectors. The P1 also delivers a large image from a short distance with an image diagonal of 40" from just over three feet away. This puts the P1 in an interesting spot about halfway between a standard and a short-throw projector. For small meetings, you can get a good-sized image in a confined space that will be bright enough to handle most ambient light conditions. I m asking, if this Asus P1 projector can to be connected with a smart phone?. Thanks...please reply, I need it. I don't think so, I have tried multiple ways to do this but without any success... if anyone knows please tell me but I think you need an extra converter box for that infortunately... so even if the specs of this pico projector is interesting, this is a major flaw. Plus I found it a little too big compared to the Optoma. I have several problems with this projector: 1. projection of white: one third of the picture, on the right, is slightly pink, not pure white. 2. picture is sharp in the bottom, but not on the top 3. focus wheel is too soft, even soft touch changes focus Sorry for my English, I am Czech. I loved this projector until I found out that auto-keystone correction doesn't stay off once you turn it off. Every time you restart the projector auto-keystone is back on making it impossible to use for installations. Would be so simple to build this into memory of the projector but it's a major flaw. I ve found this projector so useful but recently all of a sudden its screen turn into red i mean i still watch movie but under the redish pink ligth and i have no idea what has happened. Any idea? Same problem experienced since yesterday 14 Dec 2013. When not connected to computer display seems normal but once connected display turns so reddish that I have to stop using the projector. Projector was bought in the U.S. but used in India. Is there an ASUS service facility in India that can fix the problem? I have same problem with red screen. Have you manage something with that?